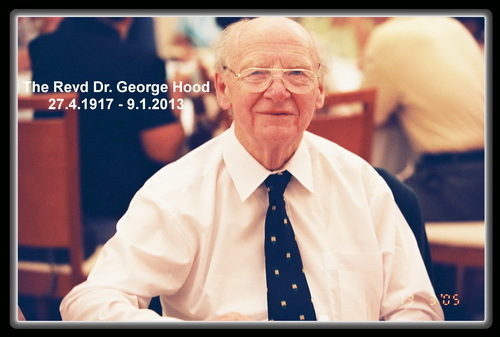 Members of this congregation, it gives me great honour and yet sadness to deliver a eulogy for the Revd Dr. George Hood who passed away peacefully in his sleep in the early hours of the morning of Wednesday, January the 9th at his home in Alnwick, Northumberland, England. According to his daughter, Catherine, George was normal the night before when she helped him to the bed. He was 95. This Church remembers him as the one instrumental in restarting this English Service on the evening of the first Sunday of August, being 3rd of August, 1952 after it had ceased shortly with the passing of Dato’ James Meldrum in 1904. George was a veteran missionary and Church historian. Born on Friday, April 27, 1917, he graduated in history at Oxford and studied at Cambridge for the ministry of the Presbyterian Church of England (now known as the United Reformed Church). In 1943, he was ordained at Trinity Presbyterian Church, Newcastle to serve as a missionary. He first served at the English Presbyterian Mission in Lingdong Synod of the former Church of Christ in Shantou (or historically known as Swatow), China, between 1945 to 1950. This was also the area in which his wife, Elizabeth’s parents and grandparents had worked from 1869 onwards. Elizabeth passed away on October 7, 2010. When the missionaries were expelled after the new communist government took over China, George was redeployed to Malaya at the invitation of the Chinese Presbyterian Church in Singapore and Malaya. One reason for his appointment to Johor Bahru in 1952 was his ability to speak the Shantou or Teochew dialect, and indeed his command of the dialect was impeccable. This was also the time of the Emergency when many new villages were created. Each of these places had a church seeking to minister to the many Chinese who had been removed from their homes and brought into these protected areas as part of the campaign to defeat the Communist insurgency. It was then a great opportunity to bring the Gospel to the people in need. Hence, George was an interim moderator, which was effectively a full-time minister, of Holy Light Church between 1952-1959 and then 1967-1968. During these periods, he also ministered in Presbyterian churches in Air Hitam, Kahang, Kluang, Kota Tinggi, Kulai, Mersing, Muar, Paloh, Rengit and Senai. He also served as the General Secretary of the Synod’s Five Year Movements for Malaysia and Singapore from 1961 to 1971. According to the Northern Region of the United Reformed Church’s website, George had played a major role in the integration of the Chinese speaking and English speaking Presbyterians into one church. He was described by the Presbyterian Church of Malaysia’s history books as a “radical young minister”. Indeed, as he once narrated that one of his most painful memories of his ministry at Holy Light Church (Chinese) was his opposition to the sale and later the distribution of the proceeds from the sale of the Roseley Estate, a 200 acres of land in Tampoi first granted to the Church by the late Sultan Ibrahim for the cultivation of pineapples. On returning to the United Kingdom, he served as the East Asia Secretary of the Council for World Mission from 1972 to 1977. From 1977 to 1982, he was a lecturer in Selly Oak colleges in its department of mission. He also contributed immensely as a Church historian. He organised the transfer of the Presbyterian Church Missionary Archives to the School of Oriental and African Studies in London University. He wrote a number of books and articles on the church in China, including: Mission Accomplished? The English Presbyterian Mission in Lingtung, South China (1986); Neither a bang nor a whimper: the end of a missionary era in China (1991) and Pilgrims in Mission: Celebrating 150 Years of the English Presbyterian Mission (1998). The last two books are still available on Amazon. My dearly beloved, George had in fact visited us three times, in October 1999, March 2003 and March 2005. Personally, when I was in London last September, I had wanted to travel to Alnwick to visit him but was unable to do so due to my tight schedule. But I did have a lengthy conversation with him over the phone which he once again demonstrated to me, despite his advanced age, his possession of an elephant’s memory. I also had the delight in sharing with him the good news of the completion of this Faith Worship Hall. However, my only regret was I again failed to make this visitation when I was in London two weeks ago. On our part, let us not overlook our history and the contributions of those before us. George’s contributions as one who had officially founded this Church will now be entrenched in the annals of our Church history. Even though we mourn the departure of a great teacher and friend, we must also rejoice in his promotion to glory in which his exemplary life has brought much glory to God and His Kingdom. May I now request that you rise to observe a minute’s silence as a mark of respect for our dear departed pastor, the Revd Dr. George Hood.